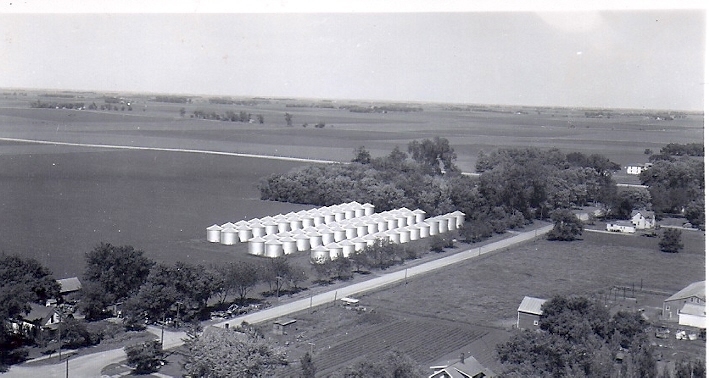 In this 1950 photo from Neil Lieb’s archive, our contributor explains what we see in this view from atop the newly completed elevator in Alta, Iowa. “Those were storage bins for the excess before the elevator was built,” he says. 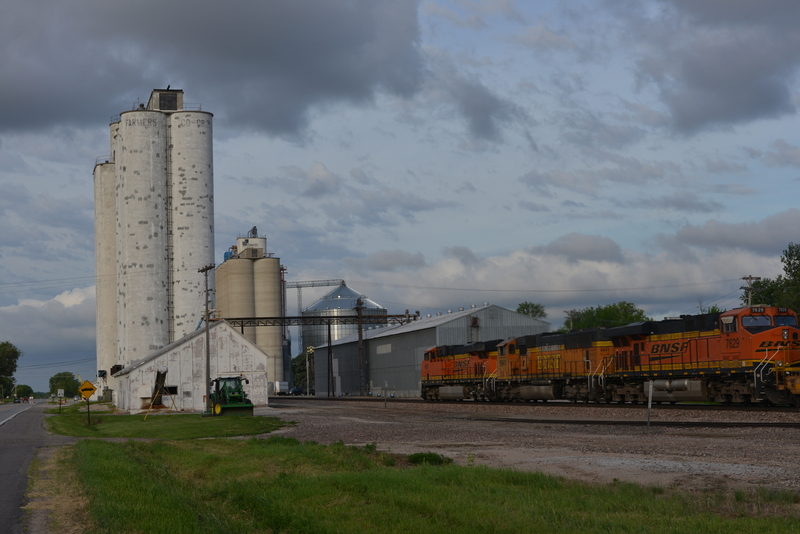 That pipe is used to run the grain down to the railroad cars when they’re shipping it. Inside of that tank, there’s a hole that connects to that pipe. The system works [this way], you open a tank at the bottom, and run the grain into the pit. You use a belt to take it to the top and into this pipe. Commentary by Neil Lieb, photo from his archive. 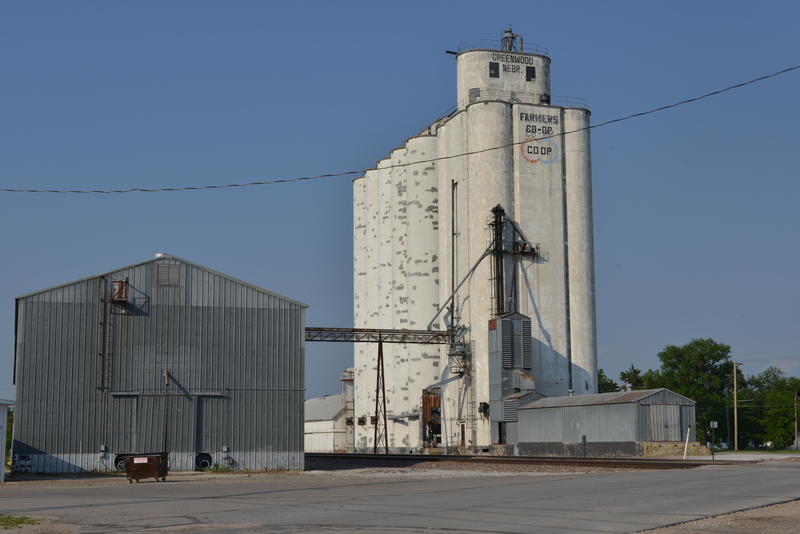 The Tillotson elevator and annex alongside the railroad tracks in Greenwood, Neb. Along U.S. 6 between Omaha and Lincoln, Neb., stands an early testament to the ingenuity of the Tillotson Construction Company of Omaha. 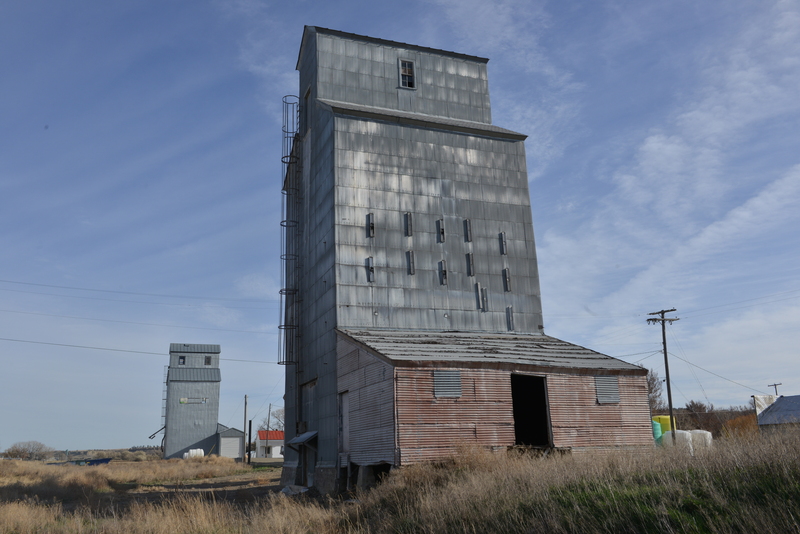 This early elevator, which rises alongside the highway next to its attached annex in the town of Greenwood, still holds grain. 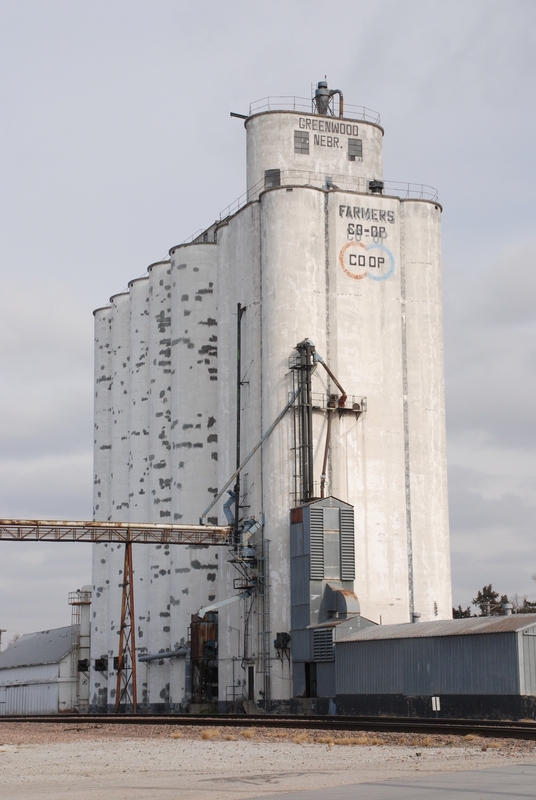 The original elevator was built with a capacity of 129,000 bushels. 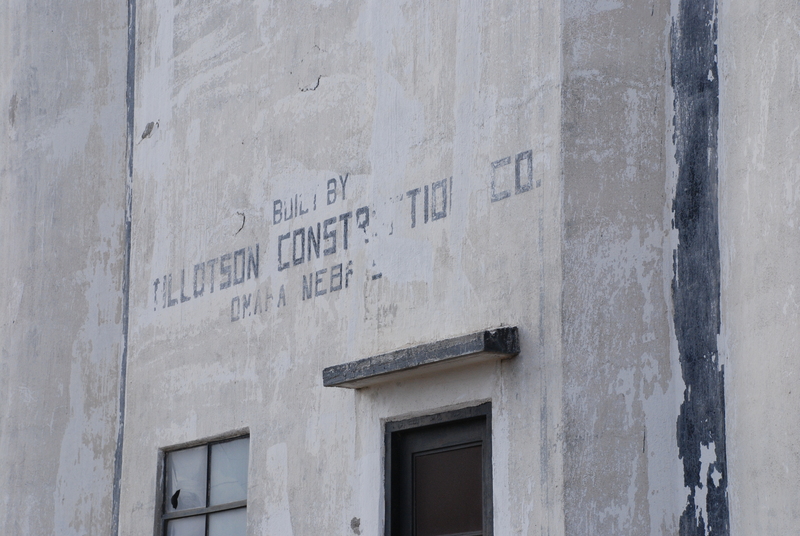 On the side facing the highway, stenciled in black, is a sign that says “Built by Tillotson Construction Co. Omaha Nebraska.” The lettering is partially obscured by paint and concrete patches. Highway 6 is a very familiar stretch of road. 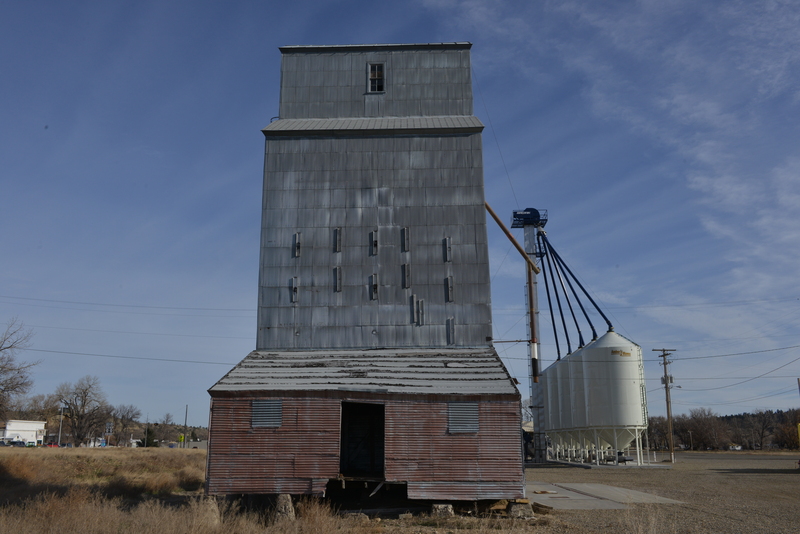 I have driven it innumerable times between Ashland and Lincoln while visiting my family–on every run to Lincoln, the old Tillotson elevator and its annex come up on the right side of the road about a third of the way there. As a little girl, when traveling across Nebraska, I would see a white edifice on the horizon, and it meant a new town was coming up and we were closer to our destination. Now, living far away, I rarely see the elevators that have become so familiar. But last summer, I revisited this one. A Burlington Northern train slows to pass through town on an early morning run. 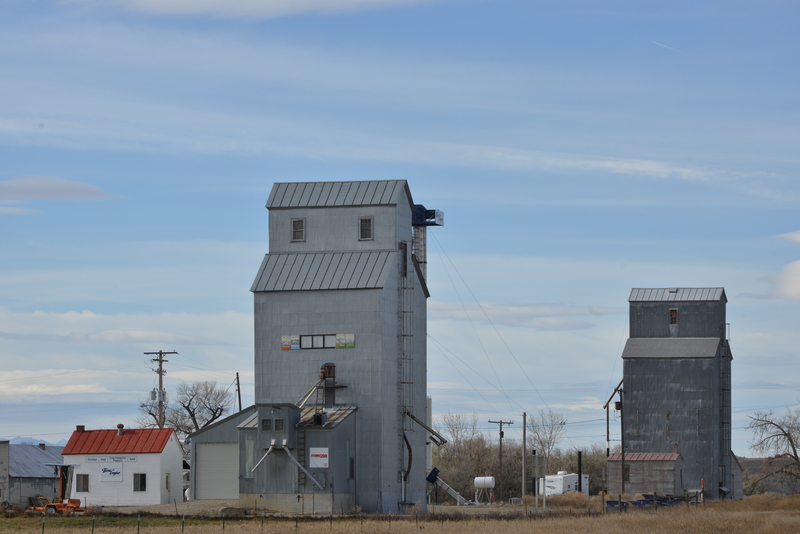 The Greenwood elevator was built in 1951. 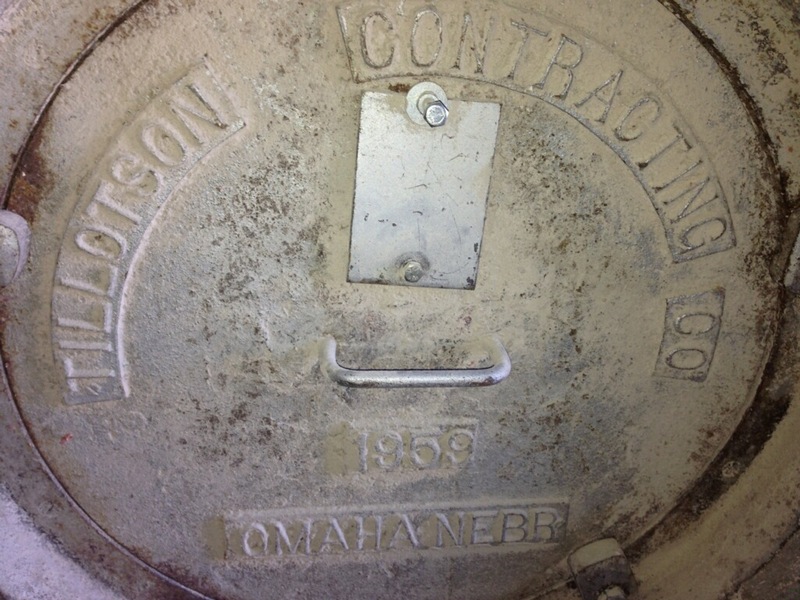 Its annex was added in 1954, and although we do not have the construction record of the annex among our Tillotson company papers, the embossed manhole covers identify its provenance. 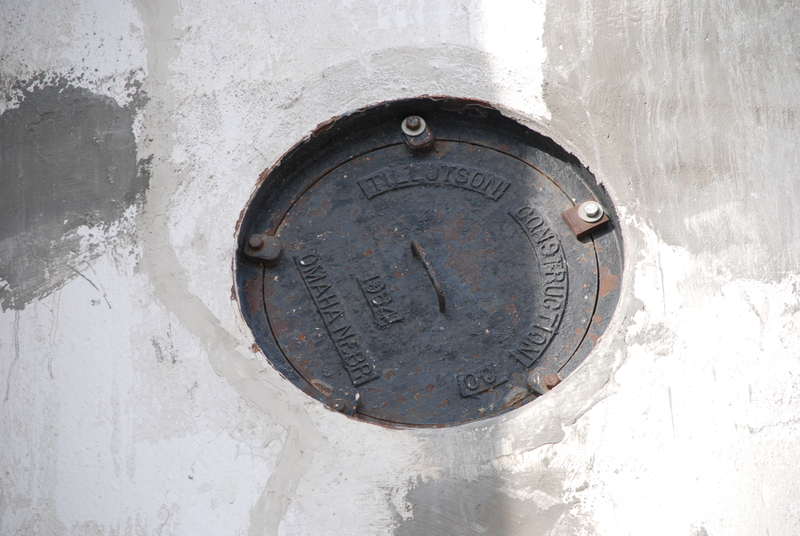 The pairing of a Tillotson elevator with a Tillotson annex is fairly unusual in the company records–usually another company would come along and build an annex. During the elevator boom, it seems very likely that the Tillotson company was too busy to meet the demand for annexes that were springing up everywhere, and it is very doubtful that they competed and lost the contract at each site. The company was too good at what they did, and it is almost certain that they had more work than they could accept. We have the building specifications for the original elevator in the Tillotson Construction Company records. 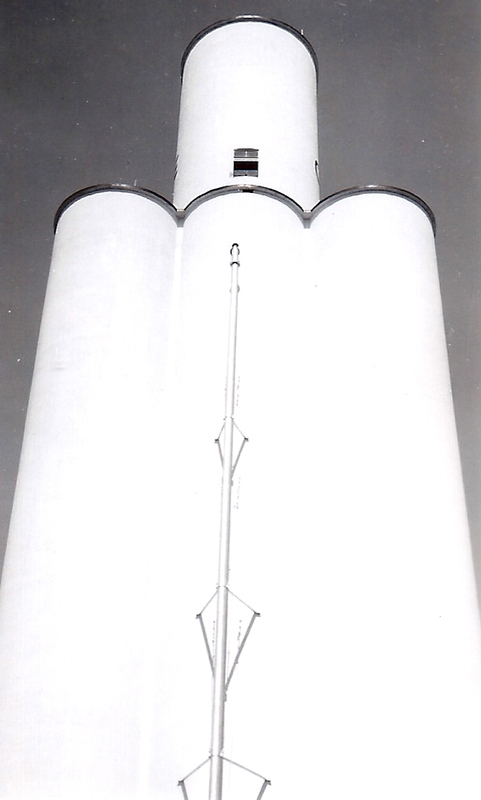 Greenwood’s elevator was built following the Churdan Plan, with four 14 1/2-foot-diameter tanks, 120 feet high, and a 13 x 17-foot driveway. The spread was 13 feet, and eight bins were built over the driveway. The plan called for 17 total storage bins and a dust bin, with bin number 8 split to accommodate a dryer. 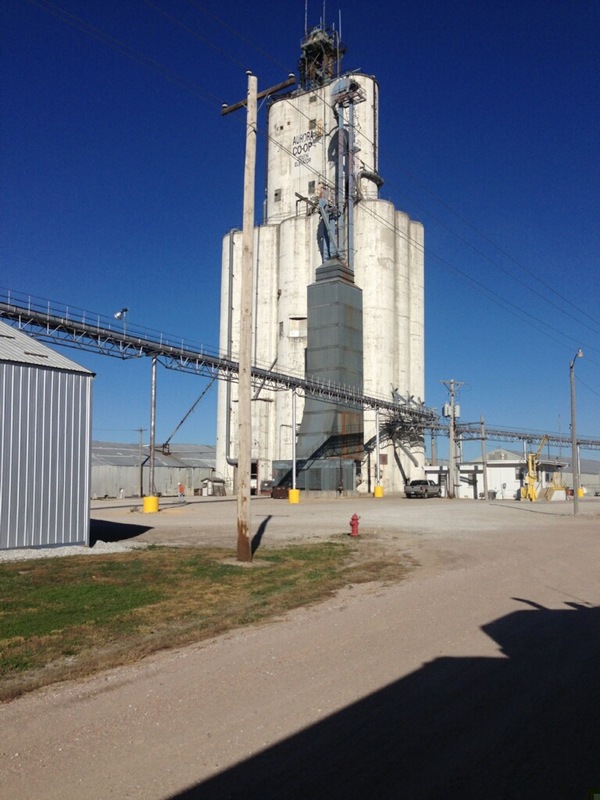 The total capacity was 129,000 bushels. Concrete repairs are evident around the annex manhole cover. The dimensions of the main slab were 49 x 49 feet, with a main slab area (actual outside on the ground) of 2,377 square feet. The total weight of reinforced concrete, at 4000 pounds per cubic yard plus steel, was 2,570 tons. Also computed at 4000 pounds per cubic yard, the total plain concrete weight for the hoppers was 50 tons. The fill sand for the hoppers, at 3000 pounds per cubic yard, was 360 tons. 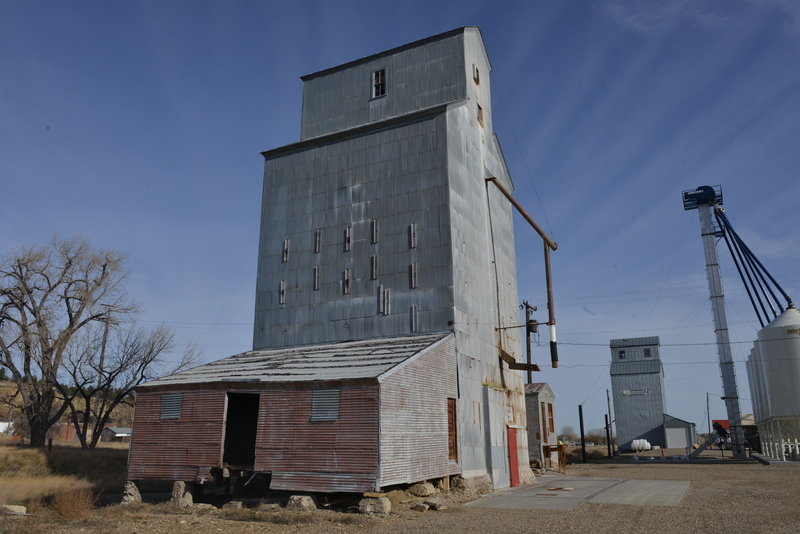 The planned weight of grain was 60 pounds per bushel, and when filled, the elevator could hold 3,870 tons of grain. Fifteen tons of structural steel and machinery were added to complete the planned gross weight, loaded, of 6,865 tons. The elevator was designed to withstand 2.89 tons per square foot of bearing pressure. The elevator was designed to operate with one leg. 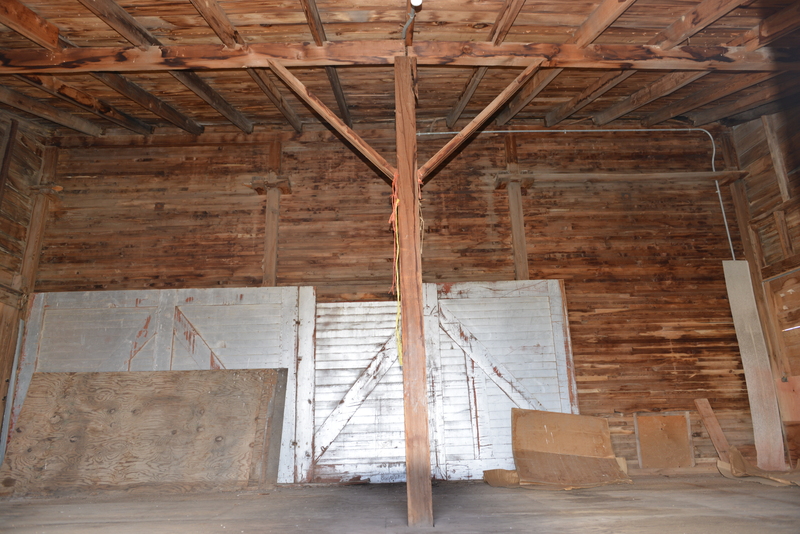 A distributor floor, track sink, full basement, and electrical room were included in the plans. Two dump grates, 5 1/2 x 9 and 15 x 9 feet, were built. The columns under the tanks were 16 x 16 inches square, and the boot-leg and head were built of concrete. Head drive: Howell 30 hp. Horsepower required for leg (based on above actual capacity plus 15 percent for motor): 22 hp. 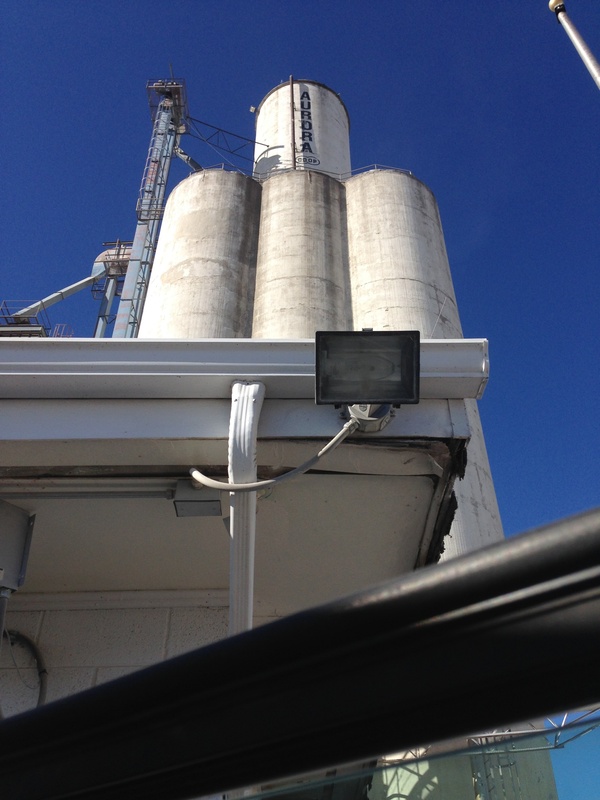 Load out spout: 8 inch w.c.
Truck lift: 7 1/2 Ehr.